LOVE'S RIVERVIEW LODGE is located in Hood River, Oregon, the unofficial ''Windsurfing Capitol of the United States" Relax in our clean, comfortable units and watch the multi-colored sails on the mighty Columbia River below. Or try the world class Nordic and Alpine skiing on Mt. Hood, 35 miles away. In summer Olympic skiers train at Timberline, where snow lingers into July and August. Our majestic, snow-capped mountains, lush forests, sunny wildlife meadows and rushing streams are perfect for your enjoyment. There is river rafting, fishing, hiking, biking and golfing nearby. Units include queen bed, sofa, AC, phones, microwaves, refrigerators and FREE HBO, TNT, movies and local calls. 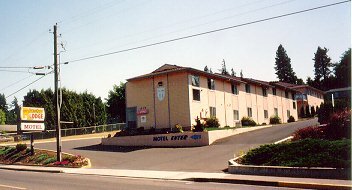 This and other Hood River Bed and Breakfast Inns can be found here in The Register.